As the recipe notes, this is simple enough for a weeknight meal while special enough for entertaining. 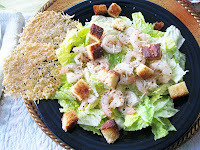 I decided to alter this salad similar to the one you can order at Carrabbas - their grilled shrimp caesar salad. If you are concerned about the amount of cholesterol with the shrimp, just remember that the majority of cholesterol is the "good - HDL" that you need. 1. Preheat oven 300ºF. Line a large baking sheet with parchment paper or foil. Draw four 4-inch circles on the paper or foil, spacing circles at least 1 inch apart. In a small bowl, combine cheese and 1/8 teaspoon pepper. Divide mixture among circles, spreading evenly to edges of circles. 2. Bake for 10 to 15 minutes or until cheese is melted and just beginning to brown on the edges. Cool on baking sheet. Carefully remove cheese rounds from parchment paper or foil. Meanwhile, for croutons: Place bread cubes in a small skillet. Lightly coat with nonstick cooking spray. Turn cubes; lightly coat again with nonstick cooking spray. Cook over medium-high heat for 3 to 5 minutes or until bread is lightly toasted, tossing cubes occasionally. For dressing: In a small bowl, stir together mayonnaise, lemon juice, garlic, and 1/8 teaspoon pepper until well mixed. Divide romaine among salad plates. Drizzle with dressing; top with croutons and Parmesan rounds. If desired, sprinkle with additional pepper. Ok, I just eye-balled where the circles would be on the parchment - definitely saves time. Already had cubed bread in the freezer - any bread that is past its freshness, cube and place in freezer bags. Love having the freezer stocked with these kinds of staples. I did heat the shrimp on the indoor grill for just a few minutes with a pepper seasoning. This is another salad that is definitely great on a hot day.